National Pet Week is sponsored by the Auxiliary to the AVMA to foster responsible pet ownership, recognize the human-animal bond, and increase public awareness of veterinary medicine. National Pet Week, May 5-11, 2019, is sponsored by the Auxiliary to the AVMA to foster responsible pet ownership, recognize the human-animal bond, and increase public awareness of veterinary medicine. This year’s theme is “Pets & Vets the Perfect Duet”. Veterinarians, their hospitals and clinics, and their communities are encouraged to celebrate National Pet Week. 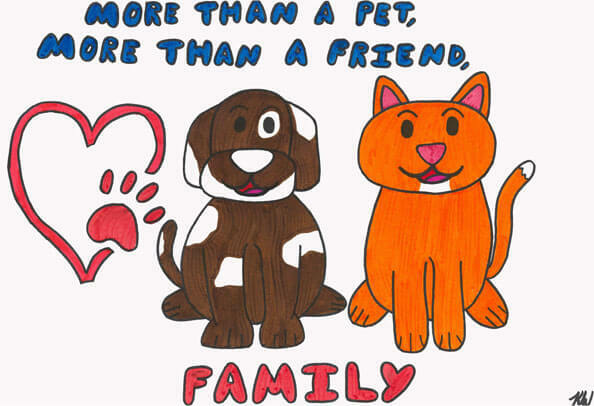 Poster and creative writing contests were conducted in 2018 for National Pet Week 2019. The winning entries are presented below. Visit www.petweek.org for ideas about celebrating in your hospital or clinic and schools.